ONDO, Nigeria (CNN) -- In the dark of the early morning, the assembled drug agents murmur a short prayer before setting out on an early morning drugs raid. 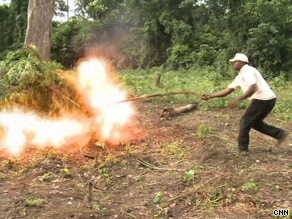 A agent torches marijuana plants found in the Nigerian forests but there could be hundreds more farms. After a few short orders, we set off into the deep undergrowth of southern Nigeria's forests on a tip-off that somewhere ahead are hidden farms illegally growing cannabis. "It's dangerous because some of them have machetes and in the deeper forest they have pump action shotguns that they use," explained Gaura Shedow, Nigeria's narcotics commander for Ondo state. Nigeria's National Drug Law Enforcement Agency, or NDLEA, are battling to stop drugs illegally transited through the country, from Latin America and Asia into Europe and the U.S., spilling over into the streets of Nigeria. As we approach the farm, orders go for out for silence and torches out. The agents spill into an opening in the dense forest, and in the red-glow of the rising sun we can make out the unmistakable leaf of the marijuana plant. NDLEA suspects there may be hundreds of farms hidden in the forest - estimating the crop they've found this morning to be about $6,000. Despite NDLEA's efforts the farmers are nowhere to be seen, but Commander Gaura remains practical. "The people that stay in these farms are not the big people. The big men stay in the cities -- they don't even come to the farmlands." Nigeria is on the frontline in the global war on drugs -- an international gateway for cocaine from Latin America and heroin from Asia to abusers in Europe and the United States. It's not known exactly how much is transited through Nigeria but NDLEA says last year they seized over 300 tons of narcotics. Focusing primarily on the main transit points -- roads, ports and airports - NDLEA claim to have convicted over 1,800 traffickers. Most of them are Nigerian. "We do have a big expatriate community of Nigerians in Europe and United States," explains Dagmar Thomas at the U.N. Office on Drugs and Crime in Nigeria. "And there is always the danger that these communities are tapped into by organized crime cartels." We spoke to one man arrested for trying to trafficking cocaine to Europe. A young graduate, he explained how after losing his job in Spain he was tempted by the offer of $5,000 to transport cocaine packets in his stomach. "When you are swallowing - taking in this thing into your body it's just as if you are signing your death warrant ... but this is what many youths do today just to make a living." And with low-ranking NDLEA officers paid on average $200 a month corruption within the agency is a key concern. "Yes, certainly there was a lot -- a lot, I think -- of corruption in the agency," explained Ahmadu Giade, the agency's chairman. "But so long as I continue as chairman of the agency, so long I will continue to dismiss anybody who's involved in corruption -- I will never spare him." But neither do the drugs. Living under a bridge in Nigeria's over-crowded metropolis, Lagos, Mercy Jon sleeps behind a public toilet with five other people. She prostitutes herself to pay for her cocaine habit. "Cocaine has destroyed my life - if it was not for the cocaine I'm taking, I would not be in such a place because I'm a learned somebody. My parents spent a lot to make sure I go to school, but because of cocaine I've ruined everything." Mercy Jon is being helped by one of only a handful of drug rehabilitation centers in Lagos -- Freedom Foundation. But struggling to find funding to cope with the number of addicts, their founder Tony Rapu is seeing a disturbing trend. "I actually think its increasing -- in the past few years we've seen more cases of heroin and cocaine abuse and in the area of marijuana it's like its getting even more common." Watching his officers systematically set about cutting and burning the seized cannabis crop Commander Gaura gestures to the flames. "We prefer to get to the grass roots and cut it down before it gets to the streets." But with the farmers and drug barons still in hiding Nigeria's drug war is far from over.